A few posts back I did a quick comparison on Microsoft MOSS 2007 and IBM Lotus Connectins to see which one is best suited for Enterprise 2.0, for Corporate Social Networking. One of the criteria we've developed in our TeamPark approach at Sogeti is that the software needs to be S.O.C.I.A.L. But what exactly does it mean? As of this moment we only have a Dutch version of our book available, so I'll try and write up a few bits and pieces here on the blog. The foundation of Enterprise 2.0 is social software. A TeamPark which has a lot in common with MySpace for instance, but with clear differences. What should your TeamPark look like? Whatever we think of and eventually build, a core requirement should be that it should be a place where people like to come to, without directions in their function description or receiving notification all day long to let them know something of interest has been added, or changed. A corporate hangout which lets people experience community and mutual interest. Various literary sources call this aliveness, as an important quality of social websites and, as far as we're concerned this pretty much nails it. It is just like in real life, as people are looking out for signs of life to find a place to socialize. Once inside that environment it takes some time to find the talk of the town. It is not really that difficult to sum up what is necessary to build a social website, more or less. Which means; which are the elements that give a website a social character. A website on which you lookup a telephone number or are reading a text is not really social. In no way you can see what happens or who else is there, what the others think and there are definately no options to collaborate. A social environment does show these signals. As soon as you can see the presence of others, track their activities it suddenly gets a lot more social. It is perceived entirely different, and these signals, or stimuli, create an environment to interact. Which (inter-) actions actually do take place, and the result of these actions in consequence is primarily dependent on the focus the designer puts in the environment. The design of the website is a dominant factor, both the layout as the interaction design, in delivering the right stimuli. All these stimuli a social environment offers, will stimulate people to engage in conversation, produce content and share ideas. A conversation is quickly started by allowing users to react to a newsarticle. Different sorts of conversations can be facilitated by various web elements ranging from Instant Messaging to Chatboxes, Shoutboxes and a forum. If there is a lot of content added to the environment, it will become important to weigh (rate) and filter which will allow content to surface that really has value, is popular, interesting, funny or up to date. With these mechanisms you avoid an information overload and stimulate quality. As soon as a website starts to get a lot of users, the urge to create subcommunities arises. Each of these will form itself around special interests or themes. In large groups individual ideas are lost in the din and a sense of anonimity grows. 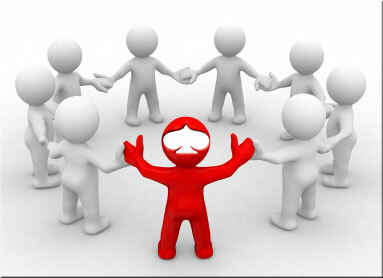 A well designed social website stimulates growing optimum sized communities. Finally, it requires enough mechanisms which truly enable to leverage the talent of the crowd. These are called aggregationmechanisms. Participation and UGC (user generated content) only is not enough. Original: TeamPark Method, the development of the intelligent organisation Page 13/14 by Arnd Brugman and Patrick Savalle, Sogeti Netherlands. 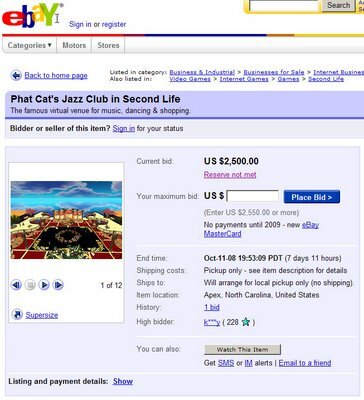 In august 2007 I blogged about Phat Cat's Jazz club in Second Life, being one of the most popular venues at the time. They have remained in the top 10 of most popular venues continuously. On october 1st the island went up for sale on eBay. "The sale provides a chance for new owners to administer and steward one of the most popular online destinations that has ever existed. Interested buyers should read the Terms and Conditions of the sale, and visit eBay starting on October 1, 2008 to place their bids." Currently the meter stops at $2.500, which is nowhere near the price Stroker's Amsterdam was sold at ($50,000). It will be very interesting to watch the auction develop and see if we can put some value to the things we so lovingly create in Second Life. 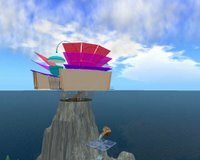 On the main MindBlizzard website I've created the MetaPages a while back which basically is a list of links to virtual worlds, metaverse development companies and the well know RL Brandlist of Real Life companies in Second Life. This weekend I've made a start with a new page; the SL Shop Directory, which now is a list of about 140 links to websites of well known Second Life shops. As usual, updates to the list are welcome, through reply on this blogpost, but better yet, why not register at the MindBlizzard website and be able to suggest links directly. 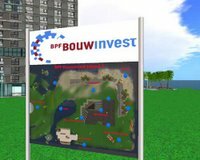 Today I visited a sim called BPF Bouwinvest, a doublesim actually. 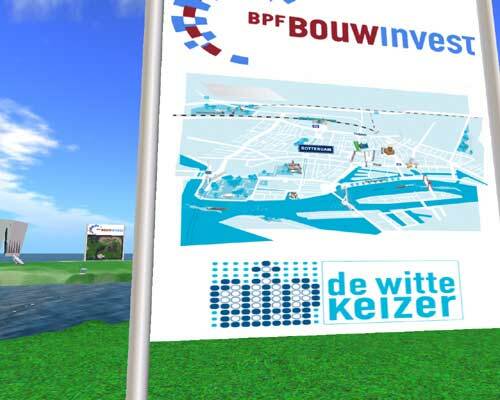 It's the virtual foothold for the Dutch Real Estate corporation BPF Bouwinvest. 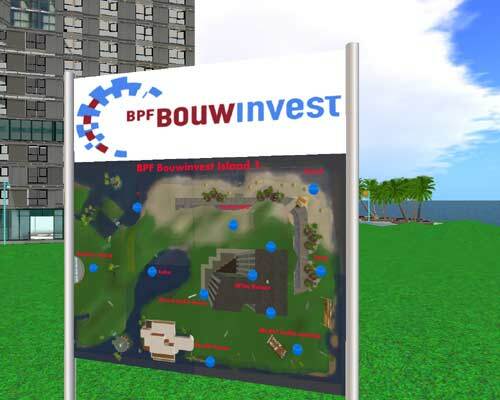 The BPF holding deals in retirement funds and about 25% of these funds have been invested in real estate through their subsidiary Bouwinvest. 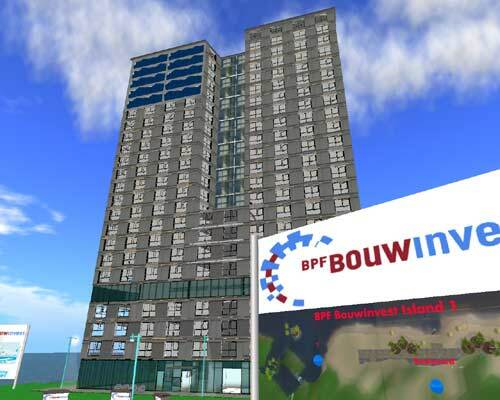 Basically what it comes down to is that BPF Bouwinvest thinks that area development is more and more becoming a knowledge intensive specialism and it aims to use their Second Life presence to enhance their knowledge about the wishes of their consumers. 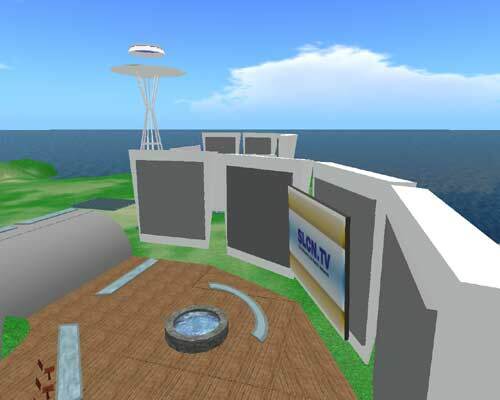 Second Life is seen as a platform to prototype in collaboration with the end user and to gain experience with new means of communication and receive feedback on their building and service concepts. 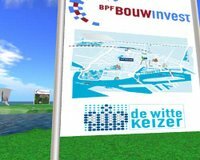 The main venue of the Bouwinvest 1 sim is the appartment building De Witte Keizer (White Emperor) which is an exact replica of one of their assets in Rotterdam. The replica has been developed by Interlocuteur M., a Second Life business consultant. If you're interested in renting one of the appartments, you can contact the real estate agent directly from Second Life. For a Real Estate company and investment fund, this is quite a logical approach to utilising virtual worlds. Yet, I'm not impressed. The Witte Keizer is about the only building on the sim (aside from a few other thingies). I'd rather seen a fully built sim with real estate, a more urban approach. Their second sim has a focus on user generated content and displays builds from the building contest they've organised in May 2007. The winning design (bottom right) won a free private sim for 6 months.